Too cool. The global community has become a local one, but phone service providers haven’t cared to notice – they’re quite happy to collect monstrous international calling charges. Now we have a way for people to call our phones from wherever they are in the world for the price of a local call, thanks to virtual phone numbers from VIR2SIM. 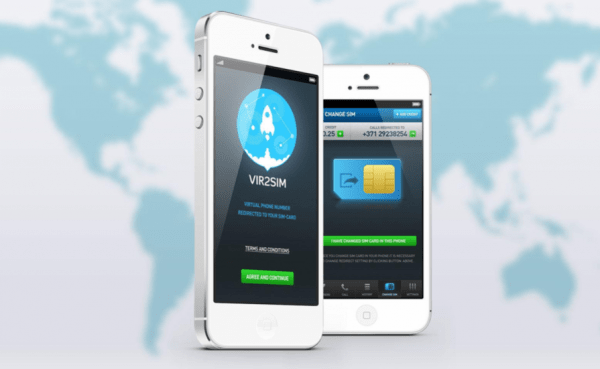 Based in Latvia and developed by start-up launcher Arcana Digital Group, the VIR2SIM service adds virtual phone numbers to your phone’s SIM card. This gives your phone as many as 20 international numbers, which allows distant friends and businesses to contact you with the ease making a local phone call. No matter where you are, no matter where your business partners might be, make and receive calls abroad, freed from the constraints of 3G or WiFi. During early testing, enterprise businesses witnessed a 31% increase in call traffic thanks to the convenience of a more recognizable, hassle-free number. How did you come up with the idea for VIR2SIM? I was living in Thailand, and I really needed a Latvian number – since I’m originally from Latvia – so that my friends and relatives could call me. I had been in the telecom business for a while, and I when I started digging around, I found out that many people had a similar need. So what we have is a service that lets you connect up to 20 numbers from 20 countries (for now) and have them attached to your Sim card – you can receive calls without the people who are calling you paying international calling rates. People call the local number that they have for you, and you pick up the phone wherever you are. It’s more about international calling than roaming charges. If you have a business in your country and your clients are abroad or your relatives are abroad, you make it easier for them to call you. You have their country number connected to your Sim card. Did your team come together in Latvia? Where did you start out? Yes, we started in Latvia. I came back about a year ago and started developing VIR2SIM myself, and then I joined Arcana. We’ve grown this project together, trying to extend both the services offered and the list of countries supported. What countries do you have on board so far? Currently there are 20 countries, including Russia, Ukraine – where it’s quite rare for a service of this kind – and also most of Europe, the United States, and Canada. Are you more geared toward offering your service to businesses or individuals? The service can be used by both, but right now we’re targeting business users. Individuals might use VIR2SIM as well, but of course they also have a free service like Skype for calling… say – your Mom in Australia – where it’s not as critical as a business call. You can call her in the evening and see her, and talk to her for an hour… but for businesses, it’s quite critical to offer clients abroad a local number. For example, if I’m a real estate agency from the United States, and I want to sell some real estate to clients in Russia, I could offer them a Russian number, and of course the Russian clients would rather call a Russian number than call a long-distance, U.S. number. What are some of the short-term and long-term goals for VIR2SIM? To help people get closer to each other, to help businesses expand internationally. The long-term goal is to erase borders, especially for business people. Our short-term goals… We launched the service as you see it now about three weeks ago. We currently have about 1,000 users. And that’s all from word of mouth, as we were beta testing it and hadn’t started any large marketing campaigns. This year, we’d like to achieve 50,000 to 100,000 users. How have you funded this project? Initially, we started all in house, using our own resources, but we’ve already attracted private investors from Europe. So we have the funding now for a pretty massive marketing campaign we’re planning for the 1st of April and for some additional features, and adding more countries. What would you say have been some of the bigger challenges you’ve faced so far? The biggest challenge is explaining to people how the service works and what it is meant for. Because it’s quite new, people have a hard time understanding how they can connect their SIM card to international numbers. And even if they grasp that, they often can’t immediately figure out what they can use it for. The market for the service and the service itself are quite new, so the biggest challenge is explaining VIR2SIM to people and having them try it. That’s why we have a free trial mode. We’re offering 25 euro cents for free, so that people can try it out before paying us any money. So, you can easily sign up, connect to any number, and you have 2 hours to test drive VIR2SIM – with some credits on your account to make and receive calls. Do you have any tips or advice for other startups based on your experience so far? It [your startup] will never work the first time as you imagined it. You try, you fail, then you try to change something, you fail, you try to change something, you fail, and then at some point it starts working. That’s what I figured out. And it’s 100% true – it never works the first time. We’ve changed like 5 times already before we came to something that people like and understand. As far as I know, this happens to everyone, like with Instagram – the functionality of Instagram is completely different from what they were first planning. So I hope we will also find our way to 100 million users one day. Bring the world closer within affordable dial-reach by visiting the VIR2SIM website, or by downloading their Android and iOS mobile apps. Follow VIR2SIM on Facebook, Angel.co, or Twitter.